It’s having a bit of a bad day, Bev. Try again now. Hi lynda my experience with a rotary hoe which i used for a number of years was that it tended to dig to a certain depth only .with this one was left with a hard pan below the level of digging. My unit was the lighter garden type with an extended arm forward of the motor and the hoe blades were driven from the end of that arm. One could quite easily get trapped in a tight corner which happened to my self due to switching the rotation of the blades to a reverse action at the time . It’s definitely warm enough. As a guide, as soon as weed seedlings start germinating in bare soil, it’s warm enough to support direct sowing. And if your garden’s anything like mine, the soil is FULL of weeds right now. Having said that, hold fire until Labour Weekend before direct sowing any cucurbits (courgettes, pumpkins, watermelons etc) or planting out tomato seedlings. Happy sowing! Thanks for the advice; your book really inspired me to give seed sowing a go. Looks like it’s also going to cost my local garden it punnet sales 😉 (laughing) Thanks again. Oh yeah I’m in Manukau, Auckland. I read your potato article. When you say Dig a trench at least 40cm deep, add a sprinkle of potato fertiliser and work in a bucket of compost for each plant. 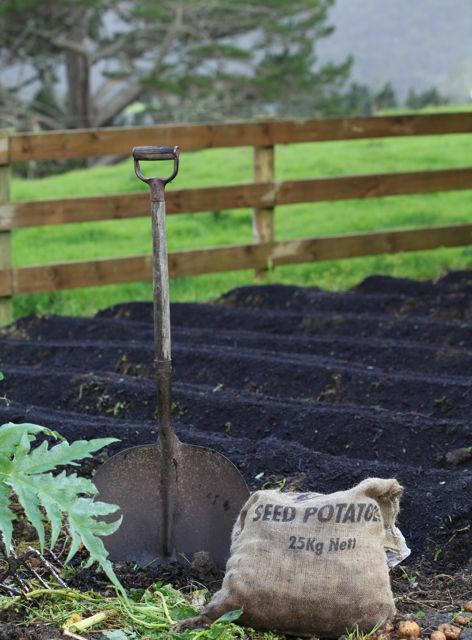 Space your seed potatoes 50cm apart, backfill the trench and mound up with more compost and mulch. Do you really mean to cover the potatoes with 40cm plus of soil (right then rather than over time as the tops grow)? To see a selection of our landscape and garden developments, please click on the video link below. Yes, I mean bury them deep and ignore them from then on. It’s such a hassle flicking up soil around the growing plants and it’s entirely unnecessary; commercial growers plant straight into the mounds at the beginning. Keep in mind that once you’ve worked in the compost, you’ve half back-filled the trench anyway, so the spuds won’t end up 40cm under the ground.